Two-man Taiwanese team Tex Electronics is pitching a micro-mechanical keyboard straight at ThinkPad fans. Called the "Tex Yoda II", the mechanical keyboard features Cherry MX Brown switches, a TrackPoint-ish pointer, and a suite of three mouse buttons. One of the reasons many people love ThinkPads is their top-notch keyboards and pointing devices. Characterized by (relatively) deep throw, red TrackPoint, and three physical mouse buttons (the middle one is for scrolling with the TrackPoint), the ThinkPad keyboard is both comfortable and convenient. The main reason for this is because when using the TrackPoint, located between the "G", "B", and "H" keys, one can move the cursor and accomplish essentially any task without needing to remove their hands from the home rows. 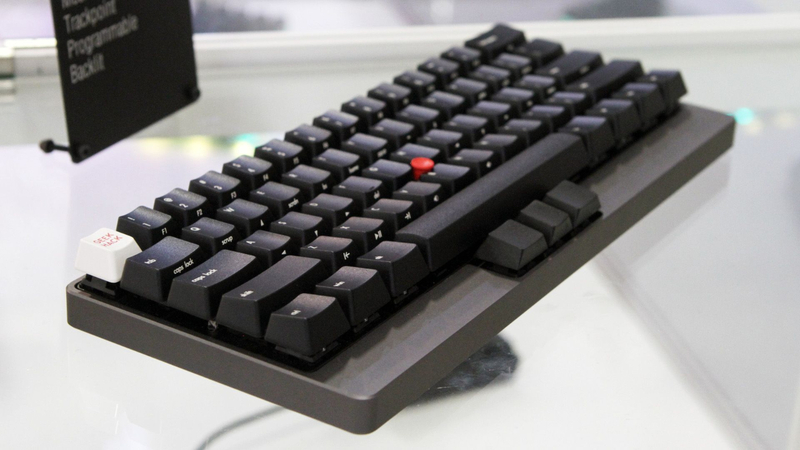 Taiwanese electronics startup Tex Electronics is targeting fans of this exact setup with their Tex Yoda II: a sensibly matte-black mechanical keyboard that attempts to reproduce the ThinkPad input experience. The Tex Yoda II certainly looks the part: The keyboard is made from a CNC-milled aluminum base into which the Cherry MX Brown switches are installed (for the mechanically uninitiated, MX Brown switches are characterized by a softer, non-clicky action). Tex's own rendition of the patented ThinkPad TrackPoint is, naturally, located between the "G", "B", and "H" keys, and the three black clickers are located below the spacebar. However, ThinkPad aficionados already are expressing doubt as to whether Tex's pointing-nub will provide as good an experience as a real ThinkPad's — not to mention outrage at the exclusion of arrow keys and dedicated "PgUp" and "PgDown" keys. One thing their keyboard does feature that a ThinkPad does not is a completely configurable engine that allows the user to customize every single key however they choose. The price hasn't been revealed yet, but it's expected to be pre-orderable in late June and ship in August.